Three Custom Color Specialists :: SPECIAL COLLECTIONS :: Hello Spring - How Do You Dew? Dewy, flushed-from-within cheeks are the perfect beauty pick-me-up as we say goodbye to this dreary winter weather and welcome Spring sunshine! NYC Makeup Artist Marisa Fazzina says dew-ing it right is easy, no matter your skin type or age. 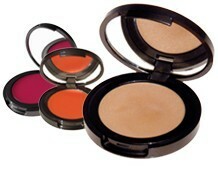 Achieve the look of healthy, youthful cheeks with two key products: all it takes is Color + Highlighter to get glowing! First, smile and apply one of our sheer and long-wearing lip & cheek stains to the apples of your cheeks: try our award-winning Lollipop shade if you’re cool and Poppy if you’re warm (Not sure if you're Warm or Cool? Click here to find out! ), then blend the color softly outward towards the temple. Check out our blog for more detailed application tips and how to take this lively Spring look from day to night!